Brianne has experience treating clients of all ages in both private practice and paediatric physiotherapy. She graduated from Carnegie Mellon University in Pittsburgh with a Bachelor of Science degree in Materials Science and Biomedical Engineering and from the University of Toronto with a Masters of Applied Science in Biomedical Engineering before graduating from the University of Toronto with a Masters of Science in Physiotherapy. 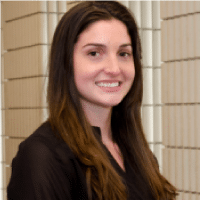 In addition to Midtown Physiotherapy, Brianne works at the Hospital for Sick Children as a consultant in a connective tissue disorder clinic. Brianne is a former Varsity swimmer and continues to stay active and engaged in sports. As an athlete herself, she has always been interested in biomechanics, movement, and a holistic approach to health. Her experience in medical research and technology development gives her a unique approach to problem solving and has fostered a life-long passion for learning and innovation. Brianne is passionate about helping you recover and uses hands-on therapy in combination with client-specific exercise prescription to treat a wide variety of musculoskeletal injuries. She has completed training in acupuncture and manual therapy and continues to pursue learning opportunities. To learn more or to book with Brianne please get in touch.